Small/Medium - €47.99 Only 2 left! Medium/Large - €47.99 X-Large - €47.99 1X/2X - €47.99 Only 2 left! We sad mortals have little insight into the specifics of the culture of the enigmatically enchanted witches of the world. We’ve made a number of efforts to get invited to the Witches’ Ball or, obviously, the Moonlight Festival. We had no expectations of getting an invite to the latter, but… everyone likes punch! All we really know is that every witch who attends the Ball wants to be truly unique… a color pallet and silhouette completely her own. So, even while we’re not invited ourselves, we at least get to help craft some spectacular looks. So, for you, we have the magical blend of enchanting refinement mixed with the just left-of-center dangerous intrigue of the Wicked Witch of the West’s green in this year’s Adult Storybook Witch costume. 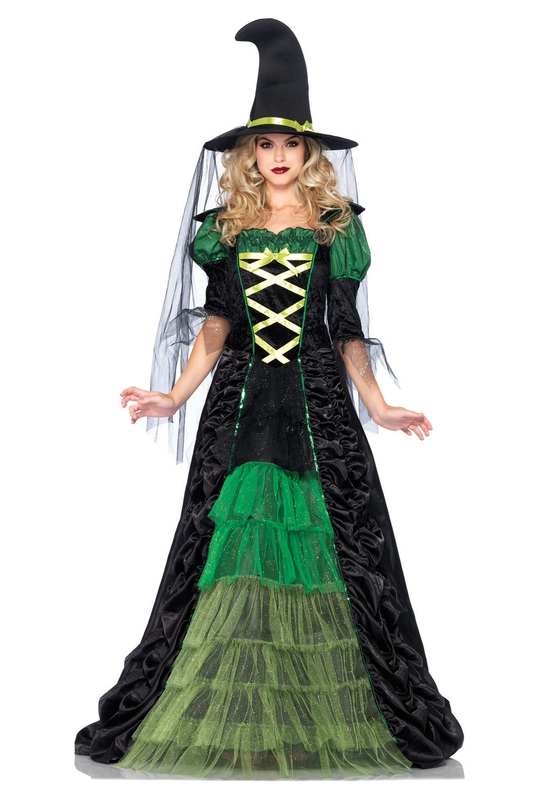 Be Witch Supreme with the high collar and puffed up sleeves that scream elegance when merged with the black cape lining, cinched with lime green ribbon lacing along the bodice. Offering a contrast that your fellow witch sisters will be envious of, the cascading glitter tulle shines in various shades of fresh green. The pointy plush hat comes with a luxurious black mesh veil, the combination of which gives you sophistication in magical style. Remember us when you’re voted to the High Courts of Sorcery!